How long has Hidden Trails been in business? Hidden Trails was founded in 1995 and began operation in North America in 1996. Previous to that many of our trips were developed and tested by our sister companies "Pegasus" in Germany and "Equitour" in Switzerland. Who travels with Hidden Trails? 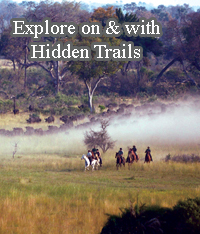 Guests of Hidden Trails are active and interesting people who come from vastly different walks of life. They live in all corners of the world, work in a variety of occupations and industries, and have many different hobbies and interests. More than 60% are between the ages of 30 and 60 with strong representation from older and younger travelers as well. Most trips have a good mix between single travelers, couples and small groups. Above all, they all have one common interest -- they love to travel in a way that allows them to fully immerse themselves in the sights and sounds of the experience. They choose adventure travel to fulfill this interest, and they choose Hidden Trails because our unique approach to backcountry travel assures them a memorable vacation experience. If you share this wanderlust, we're here to deliver! Can I purchase Hidden Trails gift certificates? Either as a family gift, for a good friend or as a company reward program we offer Gift Certificates in all amounts and time frames, from 6 to 14-day active vacation packages. To purchase a gift certificate for the active travelers in your life, please contact us at 888-987-2457. The farther in advance that you book, the better selection of available departure dates you will find. For holiday trips, you'll want to reserve eight to ten months out to find the best selection, if your dates are not very flexible. But check with us even short term ... often we can still get space only a few of weeks out. Do you have guest references for your trips? Absolutely! The trip reports are all available online for most trips. On the right hand side of the trip you will find a link to "Customer Trip Rating". This will give you an overview of how our clients have rated the trip. How do I sign up for a trip? Is a deposit required? It couldn't be easier to sign up for the trip of a lifetime! Simply "Register Online" as explained below or pick up your phone and call 1-888-987-2457. Reservations over the phone: Sorry, we cannot accept any reservations over the phone - exceptions can be made for VIP members. Please, fax in the form or start the process by using our Online System. To ensure trip availability, we recommend that you make reservations at least 120 days prior to departure. The balance of your trip cost is due 10 weeks prior to trip departure and may be paid by check, money order, Visa, or MasterCard. Please make checks payable in US funds. If you register for a trip within 70 days of trip departure, full payment is due at the time of booking. With your reservation you authorize Hidden Trails to automatically bill your credit card when the balance is due - unless you instruct us otherwise in advance. If final payment is not received when due, Hidden Trails reserves the right to treat the reservation as canceled. Refer to the Hidden Trails Booking Conditions for possible updates. Does Hidden Trails offer any type of travel protection insurance? For both Charter and Custom Tours, sign up 10 of your friends or family and the 11th guest travels at half price or in some cases for FREE! This applies only to groups who jointly confirm and pay reservations for the same trip. How long before you confirm the reservation? What happens then? It normally takes 24 to 48 hours for us to confirm a reservation (excluding weekends and holidays). First we will send you a confirmation by e-mail or fax and then follow up by mail (within North America) including our travel documentation that includes information such as where to meet, how to get there, what to bring, general travel info, etc. Hidden Trails or on any of the tours ? Our trips include accommodations, meals (as indicated), guided activity (unless otherwise indicated). Our rates also indicate if we include a transfer or not. In many cases there is an extra charge from the next major airport. None of our rates include airline reservations. All of our trips are quoted in US $ currency. Trips outside the USA are subject to a foreign currency adjustments at time of final payment. The foreign currency amount of your trip is indicated on your invoice. How can my family get a hold of me while I am on your trip? With your final payment we will send you a voucher that has some local phone numbers. Your family can also call Hidden Trails and we will put them in contact with you or our local partner. What happens in case that I get hurt during a trip ? We highly recommend that you purchase trip cancellation insurance that also covers some emergency evacuation costs. Our partner will get in contact with us as soon as possible and we will then try to contact your "Emergency Contact". Should I book my airline tickets first? Yes, you can do this, but put them "on hold" for 48 hours. Do not make firm air reservations until we confirm the trip with you in writing. Has anybody in your office tried these trips? Among all the staff in our offices in North America, Germany, England, Switzerland and France we have tested most of the trips that are being offered. In some cases we rely on trip reports from some of our VIP customers. What credit cards do you accept can I pay by cheque? We accept VISA and MasterCard. Yes, you can pay by check as well. Please, keep in mind that your trip is not confirmed until we have received your deposit ! What is a VIP card and how do I get one? A VIP membership offer additional discounts etc. In addition the card also offers special Travel Points that you collect for reservations with Hidden Trails. You are automatically a VIP when you have traveled with Hidden Trails at least twice for a minimum of 5 nights in the last 3 years and it stays valid as long as you travel with us twice within a 3 year period (minimum of 5 nights at the time). Guests are responsible for choosing a trip that suits their abilities, level of fitness and state of health. Guests must provide Hidden Trails office with signed release (and for some trips medical information) forms prior to trip departure (guests will not be permitted to join a trip without this information on file). Finally, guests traveling with Hidden Trails are expected to follow environmental guidelines and regulations in accordance with leader direction as well as respect the rights and privacy of other trip members. An individual may be asked to leave a trip if the leader feels that the person's continuing participation may prove detrimental to the individual or to the well-being or enjoyment of other guests. fax us at 604-323-1148 or e-mail us at info@hiddentrails.com . Do you sell only horseback riding vacations? Call 1-888-987-2457 or e-mail info@hiddentrails.com . How should I train for my trip? While you don't have to be an "athlete" to enjoy a Hidden Trails trip, you will get the most enjoyment from your trip if you are reasonably fit. We encourage you to engage in some sort of aerobic activity three times a week and to slowly increase the distance and difficulty of this activity. A week or two before the trip you should be comfortable riding, walking or biking, etc. the distance or duration that is typical of a day on your trip. We also recommend that you get comfortable training up to several days "back-to-back" as we typically are active for at least 5 to 6 consecutive days on our tours. For all horseback rides: Riding tours are different than riding in the arena ! Make sure you have adequate hacking experience before going on any of our riding tours, unless they are marked as a A or B level. Most guest ranches are suitable for all levels, but working ranches are more demanding. How do you accommodate guests of varying abilities? Each trip is rated for its difficulty level. Please review the trip descriptions throughout this web site or in our catalog for more information. All trips have ratings, noting the range of distances and options that are available on the trip. Though it varies from trip to trip, the average is 4 to 6 hours per day. On most trips luggage is transported by vehicle between inns. You only need to carry clothing and personal items desired for that day's activity (in some cases lunch). Wilderness pack trips are often only supported by pack horses. In general your baggage is limited to 18 lbs (8 kg). The average group size on Hidden Trails trips is 10 - very few trips may be 16+. Most trip descriptions indicate the minimum and maximum number of participants. What happens if not enough people sign up ? Many of our trips have a minimum number of participants. In very few cases is it necessary to cancel due to lack of participants. In this case Hidden Trails will try to find alternative trips for the same time period. If that does not work out, a full refund is made - sorry we cannot be responsible for your air reservations. It is always a good idea to purchase trip cancellation insurance, which should than cover some of these expenses (check with your insurance provider!) - also make sure to insure the air portion of your trip as well (we would normally only insure the trip cost for you - so let us know the details !). Are there trips my whole family can enjoy? If I'm traveling alone, will you find me a roommate ? If you are traveling alone and wish to share accommodations, on several of our International trips we try to match you with another trip member. If we cannot find a roommate for you, you may be charged for a single supplement, but on several of our trips we will take the risk and do not charge extra - check with us first. You can also use our "Buddy Finder" to hook up with other riders. Single room supplement prices can be found on individual trip pages. For many trips, requests for single rooms are confirmed at the time of reservation. On some trips single rooms are limited, therefore we suggest that you register for your trip at least 90 days prior departure to ensure availability. Single supplement prices can be found on individual trip pages. Single tents are available for rent on camping trips. Please consult the trip's daily itinerary or call our office to receive specific trip policies. From most gateway cities, convenient transportation is available to the assembly point. As noted in individual trip itineraries, trips almost always conclude where they began. Specific information regarding your trip meeting and ending times, transportation to the assembly point, and driving directions are included in your Confirmation Packet that is e-mailed or mailed to you upon registration. If you wish to make airline reservations before receiving your planner, please contact your Trip Consultant for trip starting and ending times. Optional van transfers are available from some of these locations to the meeting place and back at trip's end. Advance reservations are required. How can I arrange my travel before and after my Hidden Trails trip? For help in arranging air transportation, pre- and post-trip hotels, rental cars or rail tickets in conjunction with your Hidden Trails trip, we are happy to assist you, but normally we leave this up to a local travel agency. We have good contacts for wholesale flights to Central and South America. Most of our clients make their other flight arrangements simply via the internet. What are standard accommodations on the trips? Standard accommodations on our inn trips are double/twin occupancy and almost always with private bath. If I'm traveling alone, can I have a private room? For many trips, requests for single rooms are confirmed at the time of reservation. On some trips single rooms are limited, therefore we suggest that you register for your trip at least 90 days prior departure to ensure availability. Single supplement prices can be found on individual trip pages. Some trips will allow you to book "willing to share" -- no supplement will apply as long as you are willing to share. If we do not find a share - still no supplement. This is not available for all trips ! Upon receipt of your reservation and deposit, we will send a confirmation and pre-departure packet. This packet will include a daily itinerary, suggestions for preparing for your trip, a list of items to bring, information about the trip meeting point, gateway city transfers and pre/post-trip lodging. I've already made a reservation? You may transfer from one date to another of the same trip in the same year if available for a $125 administrative fee, after which time our cancellation policy applies. In general it is not possible to switch to another trip altogether. International travel requires a passport. Your Confirmation Packet contains details about required documents, if applicable for your particular trip. Guests from countries other than the United States should contact the closest consulate for the country to which they're planning to travel to determine if a visa is required for citizens of their country. Besides your spirit of adventure, all you need to bring is your personal gear. Don't worry, we'll send you a detailed clothing and equipment list in your pre-departure information so you know what you'll need. WE have a List of Things to bring on our website - each trip has a suggest list - just click on the link on the right hand side: "What to Bring"
Is it safe for a woman alone to go on one your trips? Since you will be traveling with a local guides, all of our trips are very suitable for women traveling alone. How do I find out if I need a visa for this trip? How do I know what city I am supposed to fly in? This information is normally given with our rates on this website. If you have any doubt, please contact our office at Hidden Trails. How much should I tip the guide, driver etc? Overall we recommend to allow for a tip in the range of 10 to 15% of the trip cost. Usually it is best to leave the gratuity with the main guide or the front office. Ask them to distribute the tip among all of the staff. Some guest ranches and tours do charge a gratuity/service charge up front. In this case a couple of dollars for the driver etc is appropriate. You can always tip in US$ currency. In some countries where Western clothing is hard to get (Morocco, Tunisia, etc) it is also a good idea to take along some articles like jeans, t-shirts, etc. The locals will appreciate them more than money ! Are helmets mandatory for the horseback riding tours ? There are some countries like Ireland, and all of the UK where helmets are mandatory. For most other destinations this is not the case, but we always highly recommend to wear a helmet when riding. You should bring your own ! Do the guides carry radio's or mobile phones on the backcountry trips? Since reception is a problem this does not always help. So, be prepared that communication to the world is not always possible. Our local guides have experience with this and know what to do in case of emergency. What happens if I do not feel like riding one day can I stay behind? This is possible on stationary and starrides, but not always possible when on a point-to-point ride, since the horses have to come along and it is not always safe to have several loose horses. In emergency situations this can of course be done. What saddles do they use? Usually all rides use a typical local saddle. We have indicated the saddles that are available for each ride. When we indicate: English please, understand that most operators do not use English dressage saddles for riding tours, but they are normally a deep seated Trekking saddle. Many operators use a modified cavalry saddle, since the are most suited for long distance riding. Can I bring my own saddle/horse? Yes, in most cases this is possible. Keep in mind that we reserve the right to refuse the saddle if the guide thinks that it could hurt the horse. Check with us first ! Pack trips usually have a limit of 18 lbs per person incl. sleeping bag etc. You can always tie up your coat on the back of the saddle ! Keep it light - normally you only use half of what you take along anyways. On all vehicle supported rides weight is not so crucial, but keep it within reason! Soft luggage is always better than large hard suitcases. In many cases you can leave some luggage at the starting point and pick it back up upon return. Does the outfitter supply duffel bags or saddlebags? Yes, most of them do. A few of them charge a small fee. Yes, most trips are suitable for non-riding companions, but they should be prepared to rent a car, so they can go sightseeing on their own during the day.